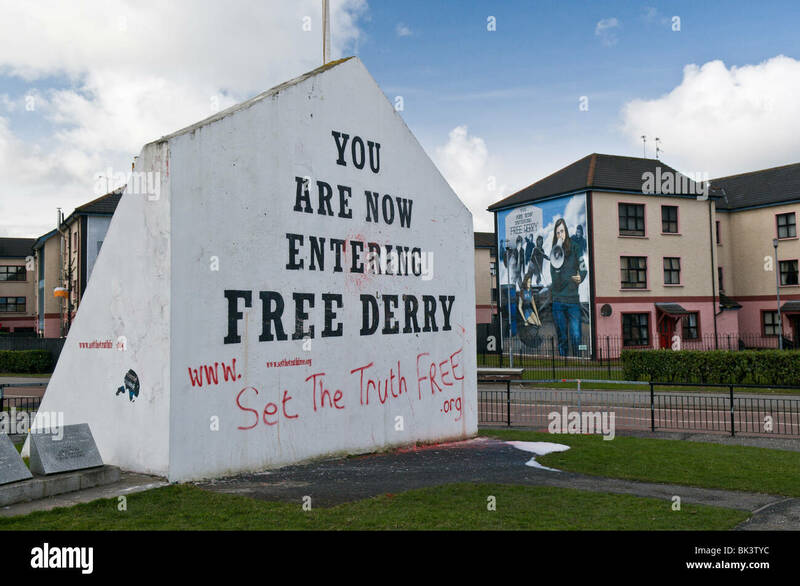 All that remains now is the gable wall of what was, in 1969, 33 Lecky Road, the last house in the row, also known then as Fox’s Corner, and now known as Free Derry Corner. 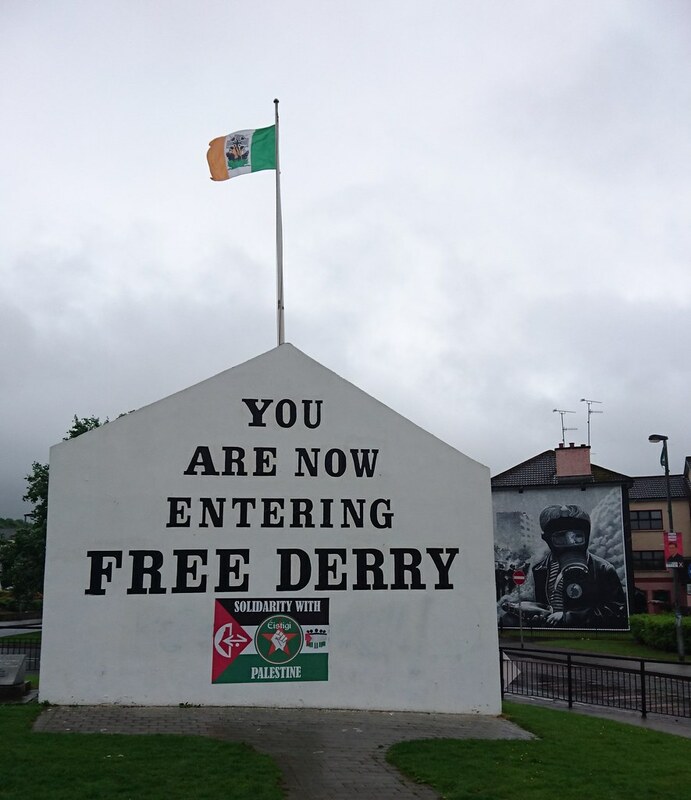 In the image below, Free Derry Corner is the northern wall of the unit marked in red. Fahan Street comes in from the right, St Columb’s Wells comes in from the bottom middle to meet it, and Lecky Road runs along the left-hand side. 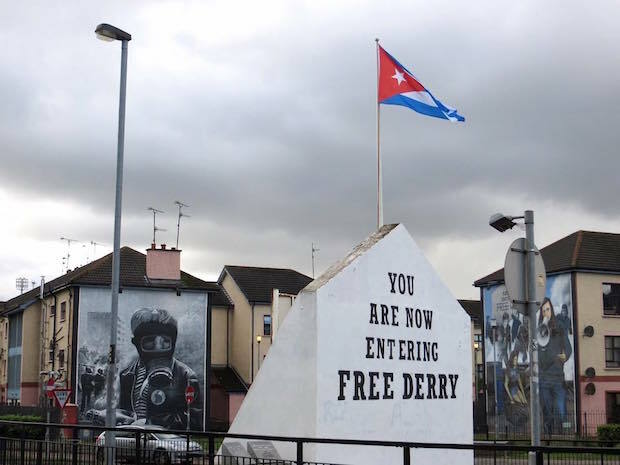 Some sources give “Columb’s Street” as the address of Free Derry Corner, intending “St Columb’s Street”, citing Eamonn McCann’s War And An Irish Town. A “St Columb’s Street” is listed in a 1911 directory of Derry. Maps of the time (1969) appear to show Fahan Street and Lecky Road intersecting but perhaps St Columb’s Street is the span at the end of Fahan Street between Lecky Road and St Columb’s Wells. Here is an aerial image, (taken from the Bloody Sunday Inquiry, as presented here), of the Bogside in 1972. 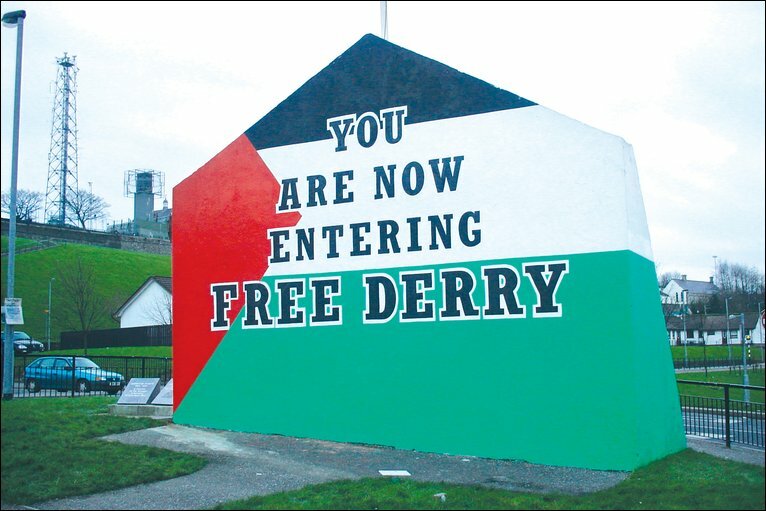 The view is looking northeast; the river Foyle is visible at the top, the walls of the old city run from top to bottom just to the right of centre, and the steep grassy slope that sweeps down to Free Derry Corner is in the bottom centre. 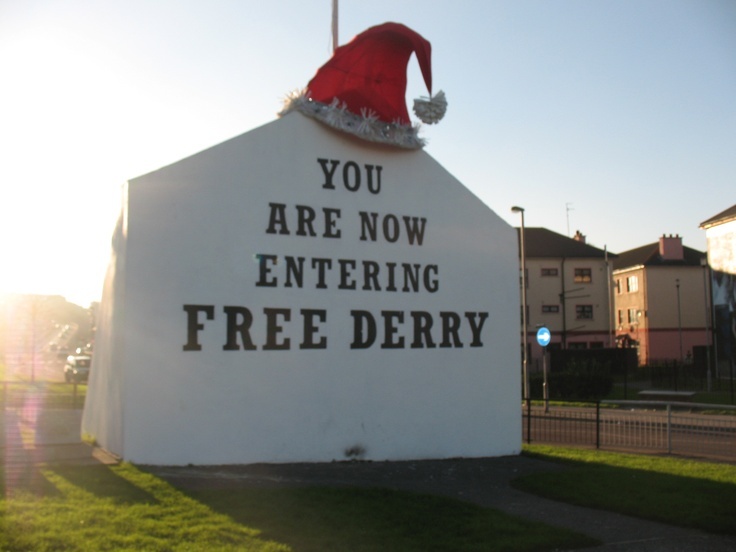 The houses of Lecky Road are still in place, with Free Derry Corner at the top end. St Columb’s Wells is the street at the bottom-centre of the image. 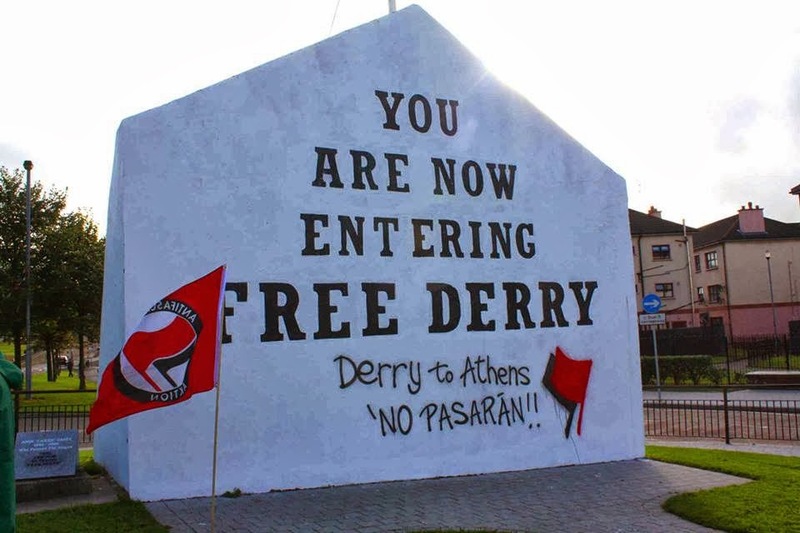 And Eamonn turned around and said, ‘Why don’t you go and paint a sign on that gable wall over there?’ I asked what we should we paint up, and guys made suggestions like “We Demand Free Beer” and various other things. 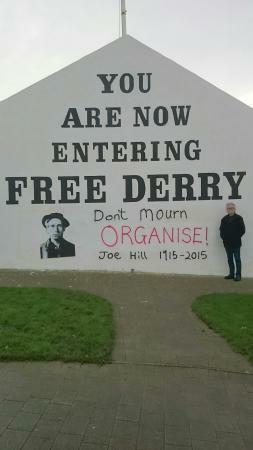 Then McCann turned round and said, ‘Why don’t you stick up “You are now entering Free Derry”?’ I said, ‘That’s it, we’ll stick that up,’ and turned round and said, ‘anybody know where I can get some paint and a brush?’ And this wee fella standing on the right-hand side of me said his aunt lived up the street a bit. 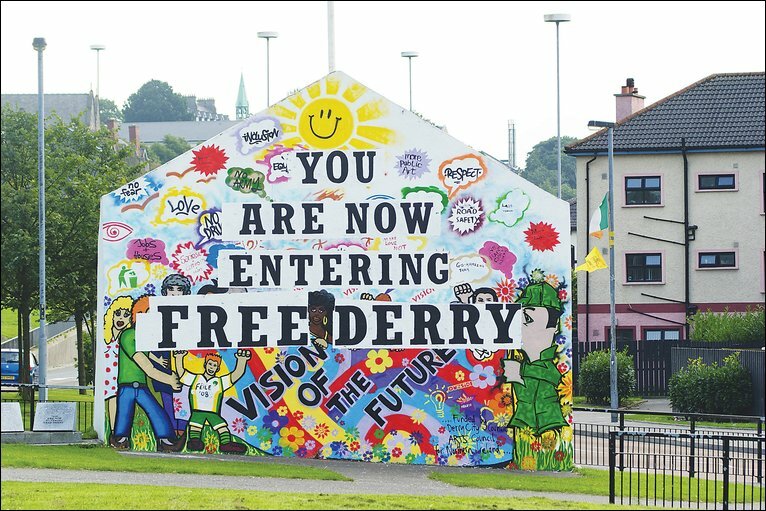 There is a Guildhall Press image (possibly by Barney McMonagle) of “care-Free Derry”. 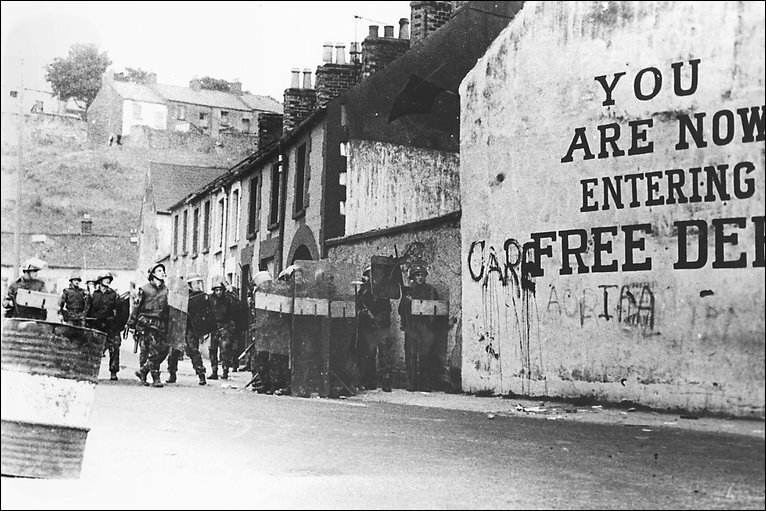 Here is a shot of the wall in 1972. 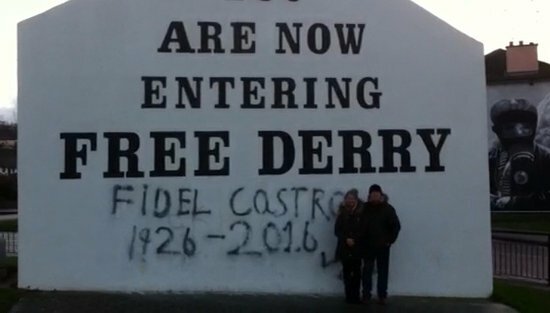 The words “Free Derry” are now in white, on black squares. The houses were demolished in 1975 but the gable wall was retained (Derry Journal: 1974 discussions | 1975 final decision). Here is an image from 1976. 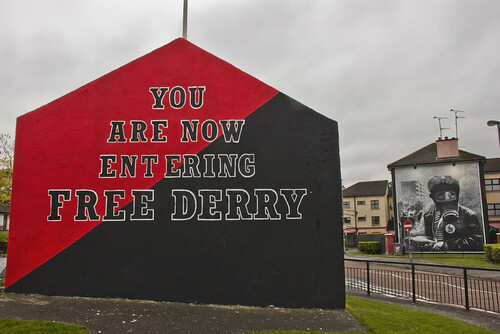 The wall, including the slogan, has been repainted. 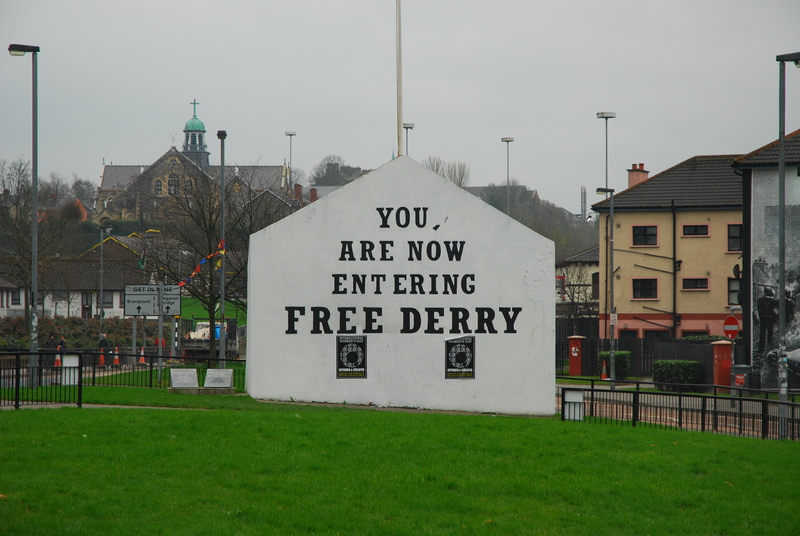 A Derry Journal article from 1976 reports a petition of 154 signatures claiming that the wall is unsafe. 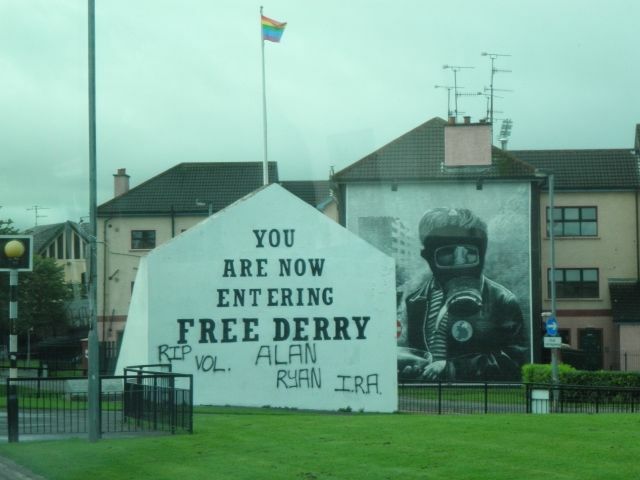 An image from 1978 with the wall surrounded by fencing. 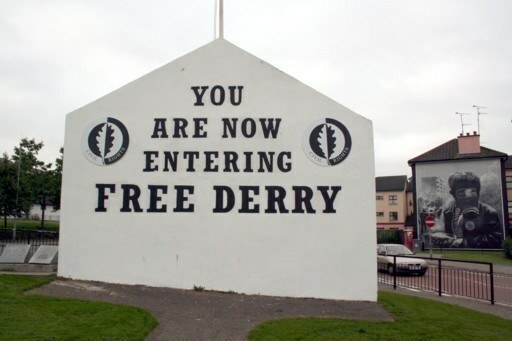 By 1981 the fence has been removed and the slogan re-painted in chunky lettering. This 1986 image shows the wall now with an apex and buttresses, and a flagpole. 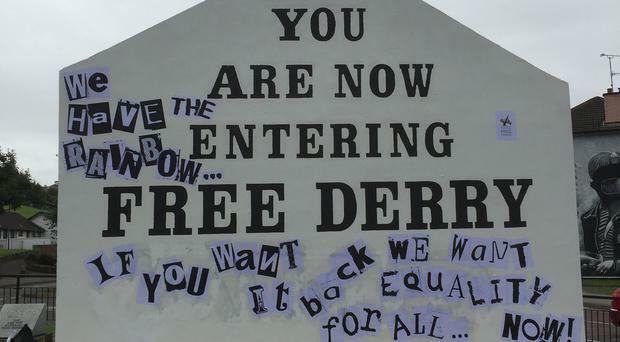 A new, full-size slogan in sans-serif font is painted on the gable. The old maisonettes are still standing in the background. 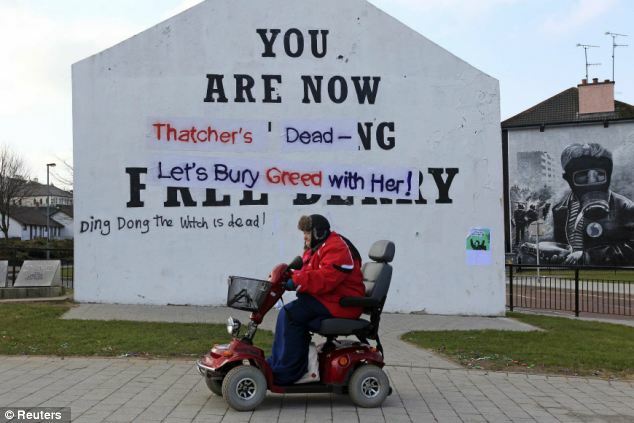 Some time between 1990 and 1994 the slogan was first “augmented” in the sense that other elements were added to the wall. 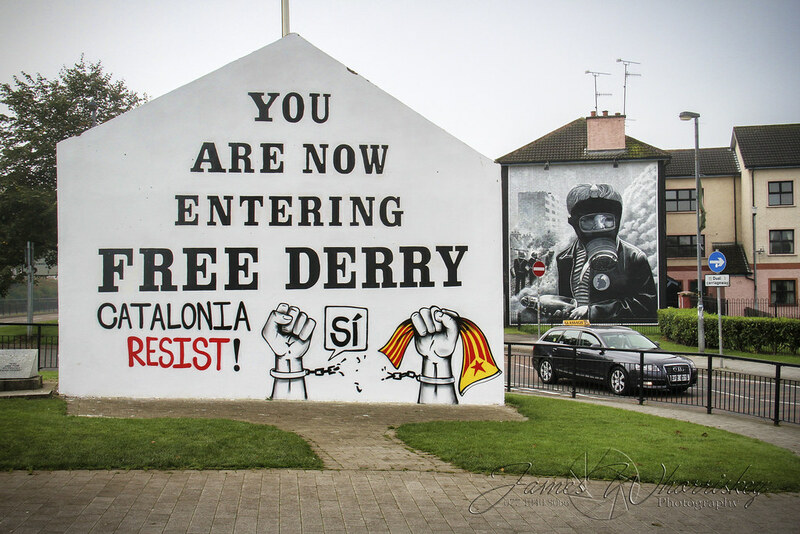 In 1994, around the time that The Petrol Bomber (the first mural by the Bogside Artists) and the 25th anniversary mural for the Battle of the Bogside were painted beside it, the gable was painted bright red and the slogan painted in a skinny serif font in yellow. 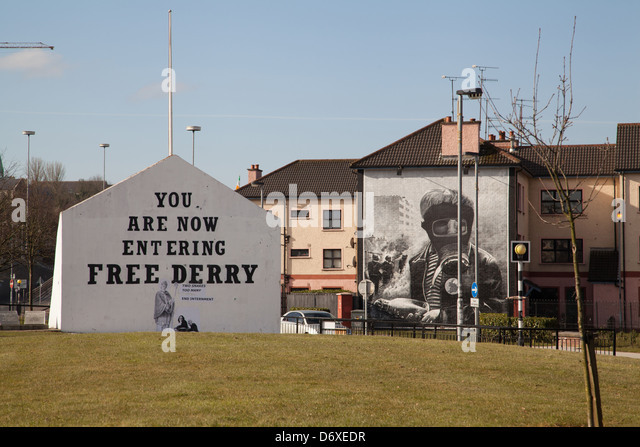 1997-01: 14 small flagpole holders were added to the rear for a black-flag commemoration of Bloody Sunday. Repaint. 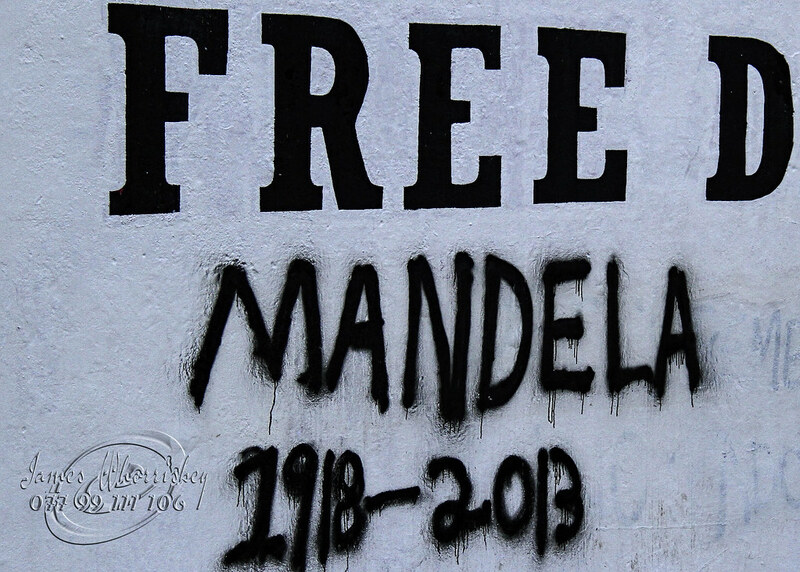 This style of lettering has persisted until the present day (2018). We will refer to this wall as “normal appearance” in what follows. 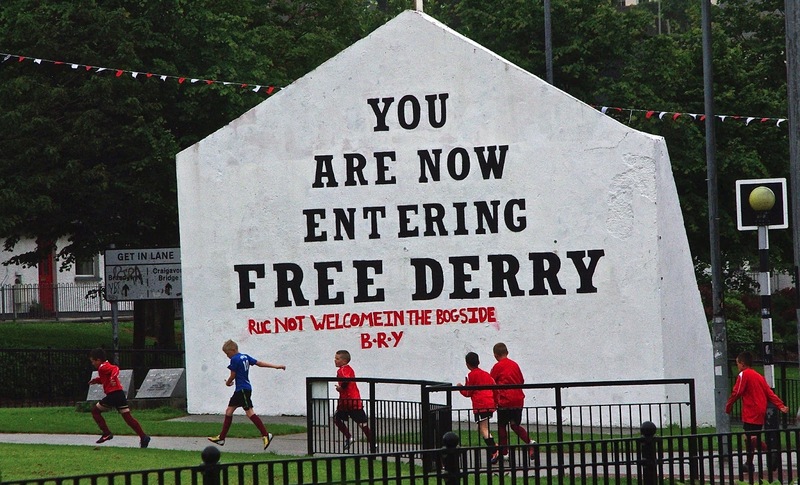 2006 normal appearance but with “Wear A Black Shamrock” stencil on buttress (M02759).